The family of Janet Louise Walker are heartbroken to announce her sudden passing at home, Monday January 28, 2019 at the age of 58. Janet was a proud career nurse who began her studies at the A. J. MacMaster School of Nursing in Moncton, NB and graduated with her RN in 1980. Janet’s first nursing job was in Halifax, NS at the Victoria General Hospital. A year or so later, she returned home to family in Moncton and worked at the Moncton Hospital. 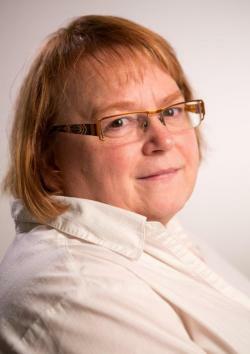 She took the opportunity to further her studies at UNB Fredericton where she obtained her Bachelor of Nursing in 1987. Janet worked the balance of her career at Horizon Health where she was a Nurse Manager of the Recovery Room and Day Surgery and organ donation coordinator at the Dr. Everett Chalmers Hospital and later assisted with the planning, building and later managed the Dialysis Unit in Fredericton and Waterville, NB. Janet was involved in the NB Nurses Union and enjoyed her work on the pension committee. She enjoyed the opportunity to work on behalf of her fellow nurses and took great satisfaction from the efforts of the committee’s work. She took great pride in her career and was proud to call herself a nurse. She made many lasting friendships with her fellow nurses and so enjoyed their company over the years. Janet was an avid crafter and enjoyed many years of cross stitching, knitting, crewel work, crocheting, embroidery and quilting. Her attention to detail and getting it exactly right was second to none. Many family and friends have wonderful treasures in their homes to remember her by. Over the past few years Janet had worked hard to remain in her own home while battling Multiple Sclerosis. She was determined to do it her way and our family did our best to support her. The family would like to extend their thanks to everyone who assisted in Janet’s care especially Lesley Fraser, Darlene Cogswell and Rachel Banks. Janet loved you all like family and we are so appreciative of your loving care to her. Janet was born June 11, 1960 in Woodstock, NB and is survived by her parents, Jack and Pauline Walker of Hanwell, NB; sisters, Nancy Walker-Deponte, Fredericton, NB and Kayla (Michael) Giesecke, Hanwell, NB; her nephews David and Alexander Giesecke and niece Kathleen Deponte along with many aunts, uncles, cousins and friends. Janet was predeceased by an infant brother, David George; her grandparents Edith and George Walker of Meductic, NB and Ruby and Gordon Cronkhite of Temple, NB. The family will receive condolences at Forest Hill United Church, 45 Kimble Court, Fredericton on Thursday, January 31, 2019 from 2-4 PM and 6-8 PM. A celebration of Janet’s life will be held at the church on Friday, February 1, 2019 at 2:30 PM with Rev. Deborah Ambridge-Fisher officiating. Interment in the spring in Meductic, NB. In lieu of flowers, the family asks you to consider donations to the Fredericton SPCA, the MS Society of Canada or the Stan Cassidy Rehabilitation Centre, Fredericton, NB.